We picked up the baler from our wonderful neighbour first thing in the morning. 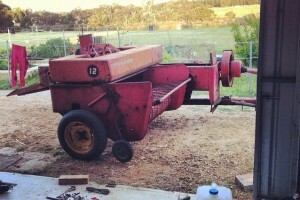 It is a 40 year old Massey Ferguson Square Baler and we just towed it behind the ute. Luckily I had watched my neighbour last year when he got the baler back into action after a year sitting out in the paddock. I knew that the shuttle needed to be freed up, but everything seemed much stiffer than last year and there was a definite sticking point. We got things moving, but the pick-up tines were catching and when Brad checked under the machine, he saw that all four guide wheels had jumped out of the pick up cam. He pulled it all apart, but one of the wheels was jammed and one was missing, so it was unlikely that they would stay in the guide. He put it back together and we took it back to the paddock and it worked for about 20 seconds before jamming again. I was pretty upset that the hay wasn’t getting baled and there was a strong chance of losing the whole crop – and a year’s worth of goat and horse food – when it rained on Saturday. We put some panicked calls into a couple of other neighbours to see if they could bale it for us. Because it was all raked and windrowed, it would only take an hour or so to bale.